Mary Lou only started birding in 1999, and yesterday she recorded her 500th bird species in North America. As I mentioned in an earlier entry (Looking for the Elegant Trogon), at the time Mary Lou started listing her bird sightings, I had been birding for over 50 years and had already recorded 474 species in the Lower 48, Alaska and Canada. It took her less than seven years to pass that number. In the meantime I had added only 98 new species, to reach my present life total of 572 of the possible 939 birds known to occur within that geographic area. We both enter our sightings into spreadsheets, and also keep track of additional birds we have seen in our travels to Hawaii, the Caribbean and Latin America. Her landmark #500 caused me to take a harder look at my own entries. Birding is a game with an element of competition, and in order to make comparisons between lists one must agree to certain ground rules. This is almost impossible for the two of us. Let me give a few examples. Out on Sandy Hook, New Jersey, we sighted a beautiful male Scarlet Tanager. It was partially hidden as it moved about in some thick foliage. Since I grew up in New Jersey, this was one of the first birds that made my list, a long time ago. Yet, living in the mountains of New Mexico, I certainly missed seeing many of the East Coast specialties, so the tanager was a welcome sight, and I was thrilled when Mary Lou got to see her first one, during her first year of birding. That night we compared notes and she refused to “count” the Scarlet Tanager! and honestly could not say whether it was red or black. I showed her the picture: “It’s black!! !” Not good enough for her. Come to think of it, I honestly cannot say whether I actually saw that particular bird’s tail, but NOTHING ELSE even comes close to looking like an adult male Scarlet Tanager (at least in New Jersey). Thankfully, we saw another the next day and this time Mary Lou was quite satisfied that she had seen his tail. My scruples over such a fine point of identification vanished many years ago. At first I did not count female warblers if they differed markedly from males. This gave me an incentive to find a few males such as American Redstart, Black-throated Blue and Blackburnian Warblers. Sad to say (or, am I relieved to say? ), Mary Lou’s ethics are also deteriorating. My bad influence, and the practicalities of birding tours, have overwhelmed her. For example, Mary Lou set out to only count birds she could identify on her own. This is fine when we walk our “patch” and have all the time in the world. But try that on a high powered birding expedition, surrounded by experts of all stripes: gull men, pelagic ladies, “peep” specialists, hawk watchers, and (worst of all) sparrow spotters. By and large, tour leaders are very patient and go out of their way to be sure that everyone in the party has seen every bird. Inevitably, the “group list” (meaning birds seen by some arbitrary small number greater than one or two) is bigger than everyone else’s. And this is how it must be, as the Pomarine Jaeger sails out of scope range over the whitecaps, or the Winter Wren ducks for cover just as the binoculars go up. Both of us “saw” and “counted” that single Yellow Rail as it fluttered up into the glare of flashlights and, in a split second, sunk into the reeds of the Manitoba Marsh. True, we had heard its calls and stalked it for many minutes, slogging in our NEOS overshoes through shin-deep muck. There was really no question as to its identity, a pale reflection against the night sky. 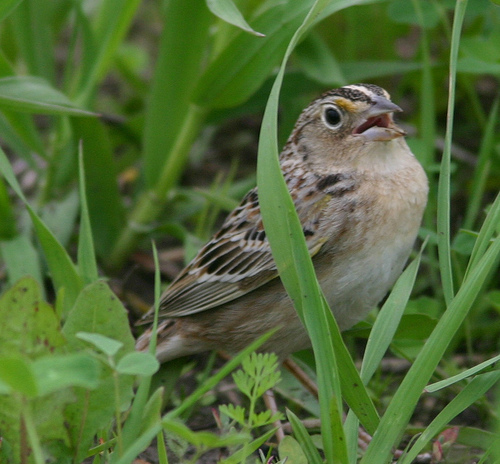 The next morning, our leader coaxed a curious LeConte’s Sparrow out of the grass in response to its recorded call. Perhaps realizing it had been duped, the bird did not tarry long enough for us to savor its rich colors. Quick! Tick it off, and then rush to see the Chestnut-collared Longspur and the Sprague’s Pipit in the next field. Under the “rules of the game” as set out by the American Birding Association, it was OK for us to count the Yellow Rail solely on the basis of its distinctive call. [For a first encounter with a species, no matter which list is involved, identification may be by sight or sound. The sighting or sounding may be brief, but in combination, field marks seen or heard must be sufficiently distinctive to distinguish the bird from all other species]. Yet, that experience so differed from the time when, as a kid, I saw a ghostly Barn Owl fly under the outfield lights during a Brooklyn Dodgers’ night game at Ebbet’s Field. By habitat, head-heavy shape and pale color, that owl could have been nothing else that exists on this planet. For me, it was not good enough to “count.” Years later, after many near misses, I caught an unsatisfactory glimpse of the same pale creature at Buffalo Lake in Texas as it flew directly away from us from one cottonwood tree to another. Still unhappy with the quality of my view of the bird, I held out until I finally saw a “countable” monkey-face looking me in the eye. I have to admit that the latter sighting was so much more satisfying, and so licit! Sure, I have seen Grasshopper Sparrows before, little flat-headed, short-tailed waifs singing weakly and quickly dropping for cover or running mouse-like through the grass. Never have I seen such a beautiful sparrow as Mary Lou’s #500. The field guides do not do justice to this one. My image (above, added in 2008) does not approach the beauty of the one we saw on our favorite patch of Everglades a short walk from our home. Unlike the drab non-migratory race that inhabits Central Florida, this Grasshopper Sparrow was a richly-adorned visitor from the north. Uncharacteristically, it posed for us for many minutes as we took in all the details of its plumage. Yes, “bird chasing” can be fun, but this was “bird watching” at its best. Read: “Finally! I Am Married to a Birdwatcher! BEIJING (AP) - A U.S. animal rights group Thursday condemned a plan to kill all pet dogs in an anti-rabies campaign in a district of the southwestern Chinese city of Chongqing. The Humane Society of the United States/Humane Society International said in a statement that a vaccination campaign would be a better way to control rabies. “Rabies is a serious matter, but local, provincial, and national government officials in China must recognize that vaccination campaigns are the most effective way to ensure public safety now and in the future,'’ said Andrew Rowan, the group’s chief executive officer. “Killing animals indiscriminately like this is unnecessary and inexcusable, especially if they’re already vaccinated,'’ he said. According to a statement on the Wanzhou district’s official Web site this week, residents of the district have until March 15 to hand over their dogs. “All the dogs in the area should be killed. A compulsory cull phase will begin after March 16. The forced cull will be carried out by the police,'’ it said. The city of Juárez, Chihuahua shared a rabies problem with El Paso, Texas. Usually, most rabies in El Paso occurred in wild coyotes in the city’s fringes. 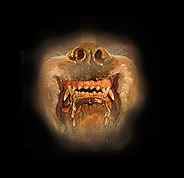 However, a few cases appeared in dogs along the Rio Grande River (Rio Bravo). Attempts to immunize pet dogs were not successful in Juárez. Dogs ran all over the neighborhoods, but were not regarded as “owned” by anyone, even though they might live under the front steps and have the run of their houses and dooryards. With financial backing from the Pan American Health Organization, Juárez then mounted a campaign to eliminate stray dogs. It was quite effective. Dogs were poisoned and shot. Their carcasses were piled up on street corners. Unfortunately, there were no funds earmarked for collecting the bodies, and the sanitation workers refused the extra duty. It turned into a pretty smelly mess until extra money was found to hire extra workers. In the early 1940s my cousin Walter (“Corky”) and I often played on the extensive grounds of the Rutherford Women’s Club, site of the Ivison Castle (pictured, now the home of Felician College) that was just being transformed into Fairleigh Dickinson College’s first campus. There were manicured lawns just right for playing stickball and flying kites. We were interrupted occasionally by a groundsman who chased us off. In the dark, we searched there for night crawlers and caught fireflies. We saw lots of birds there—warblers in the Spring, nesting American Robins and Blue Jays in the trees, and Catbirds, Brown Thrashers and Wood Thrushes in the shrubs and blackberry bushes along the perimeter. The estate had majestic elm trees that harbored Red-tailed Hawks and the hanging nests of Baltimore Orioles. Robins by the hundreds searched the 14 acres of rolling green turf for earthworms, cocking their heads (we thought) to listen for the slithering worms (but actually they were making the most of their acute monocular vision). 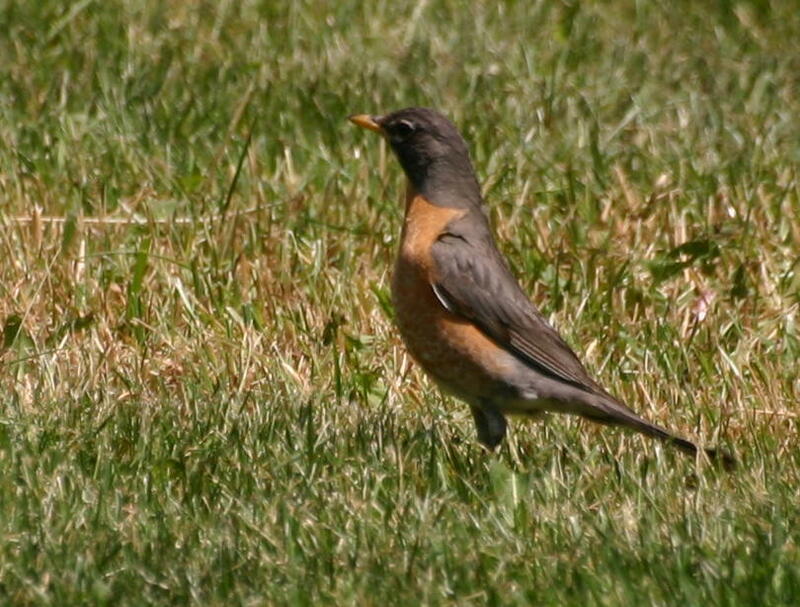 We watched the Robins teach their speckled youngsters the skills needed to catch big ones on their own. Then, early one summer, either in 1943 or ‘44 we encountered a “tame” robin that permitted us to approach it closely and even pick him up. At first, thinking that it had grown so accustomed to seeing us that it recognized us as friendly creatures, we did not realize that the bird was seriously impaired. Soon more “tame” Robins began to appear, along with others that were obviously ill and in distress. Corky and I took some of the sick birds home and attempted to nurse them back to health by keeping them warm and forcing them to drink water. I even tried using some of my baby brother’s vitamin drops in hopes of finding a cure. Every one of them subsequently died, and the lawns of the estate were soon littered with the carcasses of Robins. My father said that maybe the birds were being poisoned by something. The subject of insecticides, much less DDT, did not come up. In fact, DDT had just been released for commercial use in the USA. I remember once seeing the big elms being sprayed from the ground with a milky looking substance, using high pressure hoses. My eight or nine year old brain was probably not yet hooked up to see the connection, or maybe I did get it and simply accepted the tragedy. This was more than 15 years before Rachel Carson wrote Silent Spring. I did not know it at the time, but the worldwide epidemic of Dutch Elm Disease had just spread into New Jersey. Although Dutch Elm Disease is caused by a fungus, it is spread by the Elm Bark Beetle, probably introduced from Asia. For many years, DDT was used in a futile attempt to control its spread. As I grew up I watched it ravage the famous elms that lined most of Rutherford’s streets. Little did I expect that, in the not too distant future, the “Duck Hawk” (Peregrine Falcon) eyries along the Hudson River Palisades that I delighted in watching would be deserted, and the entire East Coast population of this species wiped out, because of the manner in which DDT concentrated at the top of the food chain. The immutable law of unintended consequences was at work. During my tropical medicine fellowship in Central America in the late 1960s, I learned of the use of DDT to combat Bolivian Hemorrhagic Fever. The illness was believed to be spread by an ectoparasite (flea, louse or mite) of roof rats and Vesper Mice, as the rodents were found to harbor the causative virus. DDT was applied liberally in thousands of homes. DDT happens to be toxic to housecats, affecting their nervous system. The rats and mice prospered, parasite-free, while the cats, that previously held their population under control, died. As it turned out, the deadly disease was spread to tabletops and food bins, thence to humans, in the urine of the now-ubiquitous rats. On Guatamalan coffee plantations I studied parasitology and took biopsies of workers whose bodies teemed with the larvae of Onchocerca volvulus, the worm that causes river blindness (Onchocercerciasis). This organism spends part of its life cycle in the body of the Black Fly that lives in fast-flowing mountain streams. The Rockefeller Foundation funded a huge program to poison all the creeks with bags of slow-release DDT. This was quite effective in reducing the Black Fly population, but what were the other long-term consequences? Ok, I’ll confess. The statute of limitations for a Federal crime has passed (unless I am charged with murder). 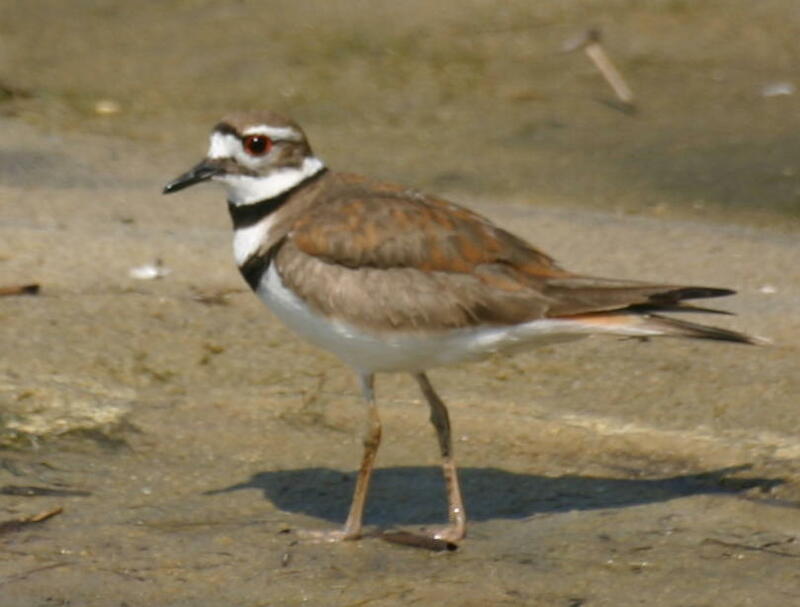 When I was about 9 or 10, I found a Killdeer nest right in the middle of the gravel parking lot between Clare’s Market and Rogers Garage on Union Avenue in Rutherford. It was easy to find, as both parents led me right to it in a reverse sort of way. Killdeer put on quite a display when their nest is threatened. The nearer one approaches the nest, the louder and more dramatic the display. At first they simply call excitedly from a distance. Then as the threat increases, they try to distract the intruder by alighting nearby, showing the bright rufous rump and tail patches, dragging a wing pathetically, even thrashing about and doing half-somersaults as if in the throes of a major seizure. If you simply do the opposite of what the birds are telling you to do, you will find the nest. 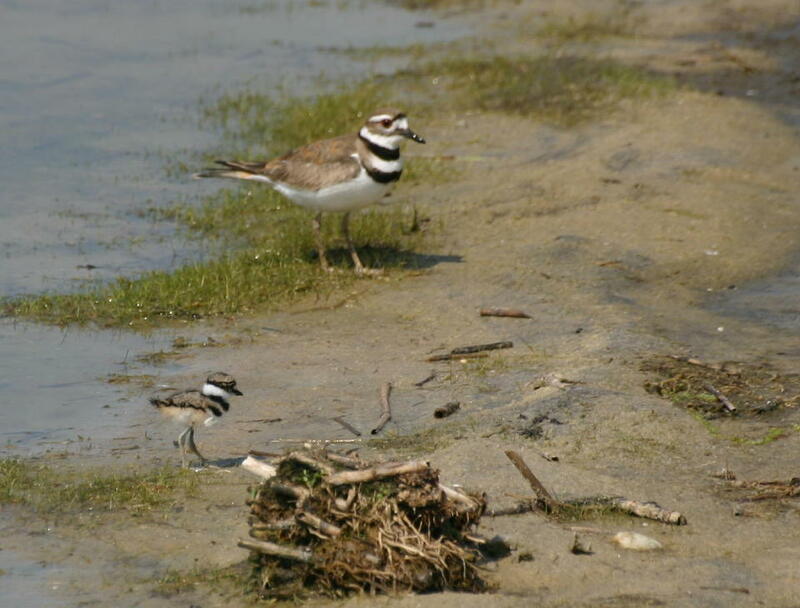 My cousin Corky and I had found many Killdeer nests in the past. The eggs or young are so well camouflaged that there is a danger of stepping on them. In this case, the nest held four eggs, neatly positioned with their narrow ends all pointing towards the center of the minor depression that served as an excuse for a nest. We were immediately concerned about the danger posed to the nest by the cars that parked in the lot. Although it was towards the back of the parking area, away from most traffic, we knew that it sometimes filled up on Saturday mornings, and that trucks sometimes pulled in to turn around after making deliveries to the supermarket. So you might say that we “hatched a plot” to save the babies. We picked up the eggs and brought them home. I had a night light with a small white Christmas tree bulb and plugged it into an outlet (shared by the toaster) that was positioned on the backsplash of our kitchen counter, several inches above its surface. We found a one pound coffee can and layered it with some wadded newsprint and then soft cotton, and placed the four eggs about 4-5 inches below the lamp. I must admit that my mother was a co-conspirator, after I convinced her of the hopelessness of the little ones. She had a couple of useful suggestions based upon her experience with her father’s poultry management, such as turning the eggs periodically and also sprinkling them with a little water to keep them from drying out. After what seemed to be a little over two weeks, only one of the eggs hatched. It was a pathetic little individual that was partially paralyzed. It did not eat or drink, and it died within two or three days. I was heartbroken and overwhelmed with guilt. I am so glad I now have gotten this off my chest! POSTSCRIPT (May 23, 2007) On a happier note, I photographed this Killdeer mother with her chick at Cape May (New Jersey) State Park last week. Her four offspring were probably only 1-3 days old. Click here for a full-screen view. Additional images are posted HERE. Off to San Isidro, or is it El Paso? The clock was ticking. My days as a civilian were numbered. When I learned of Max’s past that morning after my Washington adventure it was February 2, 1966. Only 7 weekdays remained before my induction date on Monday, February 14th. My partner took on most of my patient care responsibilities as I rushed to set up my appointment for a physical examination in Staten Island the next day. The uncertainty was killing me. Should I just go ahead and accept a commission in the Army Reserve? I called the Army, and they told me that if I immediately applied for a commission they would allow me to delay my entry on active duty until around June or July. However, if I failed to obtain a commission before February 14 I would be immediately inducted into the Army as a buck private. I did get my physical examination and passed it. I was commissioned as a US Public Health Service Inactive Reserve officer on the spot, and on February 4th I received a telegram informing me that orders had been issued for me to report for active duty on February 16th. I called the Army and was told that this was not enough to stop my induction. They clarified that I had to be on active duty in the PHS before my Army induction date, and reiterated this with a telegram to that effect, reminding me that I would be subject to arrest if I did not keep my appointment at Fort Dix on the 14th. After several anxious calls to the PHS I received new orders, to report for active duty on Sunday, February 13th, to commence official travel to San Isidro, California. There I would be working at the border quarantine station as a General Medical Officer. The next day a phone call and another telegram modified my orders, as now I would be stationed in El Paso, Texas in the US-Mexico Border Quarantine Headquarters as Assistant Medical Officer in Charge. 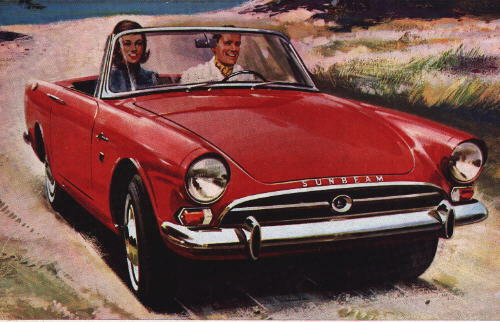 In the meantime, I sold my white 1963 Sunbeam Alpine roadster (a red one is pictured above) and Mary Lou and I put our Glen Ridge house on the market. Happily, the snow hid some troublesome cosmetic defects and added drive-up appeal. We held an open house on February 6 and sold it the next day for $24,000, exactly what we had paid for it two years previously. (Zillow.com lists its present tax assessed value as $196,000.) We immediately put all our furniture in storage. On Sunday morning the 13th I set off for El Paso in our remaining family car, a 1965 Chevrolet Impala Coupe. Mary Lou, pregnant with our fourth child, stayed at her parents’ house in Wood-Ridge with our three children. I was to find a home and they planned to fly out after the furniture shipped.